Because it is now almost axiomatic for American school textbooks to whitewash all things Islamic (see here for example), it may be useful to examine one of those aspects that are regularly distorted: the Muslim conquests. By the standards of history, the reality of these conquests is unassailable, for history proper concerns itself with primary sources; and the Islamic conquests are thoroughly documented. More importantly, the overwhelming majority of primary source materials we rely on do not come from non-Muslims, who might be accused of bias. Rather, the foremost historians bequeathing to posterity thousands of pages of source materials documenting the Islamic conquests were not only Muslims themselves; they were—and still are—regarded by today’s Muslims as pious and trustworthy scholars (generically, the ulema). Among the most authoritative books devoted to recounting the conquests are: Ibn Ishaq’s (d. 767) Sira (“Life of Muhammad”), the oldest biography of Muhammad; Waqidi’s (d. circa. 820) Maghazi (“Military Campaigns [of the Prophet]”); Baladhuri’s (d. 892) Futuh al-Buldan (“Conquests of the Nations”); and Tabari’s (d.923) multi-volume Tarikh al-Rusul wa al-Muluk, (“History of Prophets and Kings”), which is 40 volumes in the English translation. Taken together, these accounts (which are primarily based on older accounts—oral and written—tracing back to Muhammad and his successors) provide what was once, and in the Muslim world still is, a famous story: that Allah had perfected religion (Islam) for all humanity; that he commanded his final prophet (Muhammad) and community (Muslims) to spread Islam to the world; and that the latter was/is to accept it either willingly or unwillingly (jihad). According to the Muslim historical tradition, the majority of non-Muslim peoples of the Old World, not desiring to submit to Islam or its laws (Sharia), fought back, though most were eventually defeated and subsumed. The first major conquest, renowned for its brutality, occurred in Arabia itself, immediately after Muhammad’s death in 632. 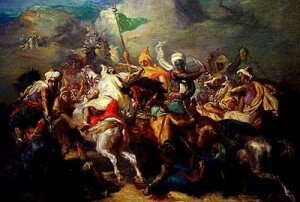 Many tribes which had only nominally accepted Islam’s authority, upon Muhammad’s death, figured they could break away; however, Muhammad’s successor and first caliph, or successor, Abu Bakr, would have none of that, and proclaimed a jihad against these apostates, known in Arabic as the “Ridda Wars” (or Apostasy Wars). According to the aforementioned historians, tens of thousands of Arabs were put to the sword until their tribes re-submitted to Islam. The colorful accounts contained in the Muslim tradition are typified by constant warfare, which normally goes as follows: Muslims go to a new region and offer the inhabitants three choices: 1) submit (i.e., convert) to Islam; 2) live as second-class citizens, or “dhimmis,” paying special taxes and accepting several social debilitations; 3) fight to the death. Centuries later, and partially due to trade, Islam came to be accepted by a few periphery peoples, mostly polytheists and animists, who followed no major religion (e.g., in Indonesia, Somalia), and who currently form the outer fringes of the Islamic world. Ironically, these exceptions are now portrayed as the rule in America’s classrooms, as many textbooks suggest or at least imply that most people who converted to Islam did so under no duress, but rather through peaceful contacts with merchants and traders; that they eagerly opted to convert to Islam for the religion’s intrinsic appeal, without noting the many debilitations conquered non-Muslims avoided—extra taxes, second-rate social status, enforced humiliation, etc.—by converting to Islam. In fact, in the first century, and due to these debilitations, many conquered peoples sought to convert to Islam only to be rebuffed by the caliphate, which preferred to keep them as subdued—and heavily taxed—subjects, not as Muslim equals. Meanwhile, as U.S. textbooks equivocate about the Muslim conquests, in the schoolrooms of the Muslim world, the conquests are not only taught as a matter of course, but are glorified: their rapidity and decisiveness are regularly portrayed as evidence that Allah was in fact on the side of the Muslims (and will be again, so long as Muslims uphold their communal duty of waging jihad). The dissimulation of how Islam was spread in the early centuries contained in Western textbook’s mirrors the way the word jihad, once inextricable to the conquests, has also been recast. Whereas the word jihad has throughout the centuries simply meant armed warfare on behalf of Islam, in recent years, American students have been taught the Sufi interpretation of jihad—Sufis make up perhaps one percent of the Islamic world and are often seen as heretics with aberrant interpretations—which portrays jihad as a “spiritual-struggle” against one’s vices. Contrast this definition of jihad with that of an early edition of the venerable Encyclopaedia of Islam. Its opening sentence simply states, “The spread of Islam by arms is a religious duty upon Muslims in general.… Jihad must continue to be done until the whole world is under the rule of Islam.… Islam must completely be made over before the doctrine of jihad [warfare to spread Islam] can be eliminated.” Muslim legal manuals written in Arabic are even more explicit. Likewise, the Islamic conquests narrated in the Muslim histories often mirror the doctrinal obligations laid out in Islam’s theological texts—the Koran and Hadith. Muslim historians often justify the actions of the early Islamic invaders by juxtaposing the jihad injunctions found in Islamic scriptures. It should also be noted that, to Muslims, the Islamic conquests are seen as acts of altruism: they are referred to as futahat, which literally means “openings”—that is, the countries conquered were “opened” for the light of Islam to enter and guide its infidel inhabitants. Thus to Muslims, there is nothing to regret or apologize for concerning the conquests; they are seen as for the good of those who were conquered (i.e., the ancestors of today’s Muslims).